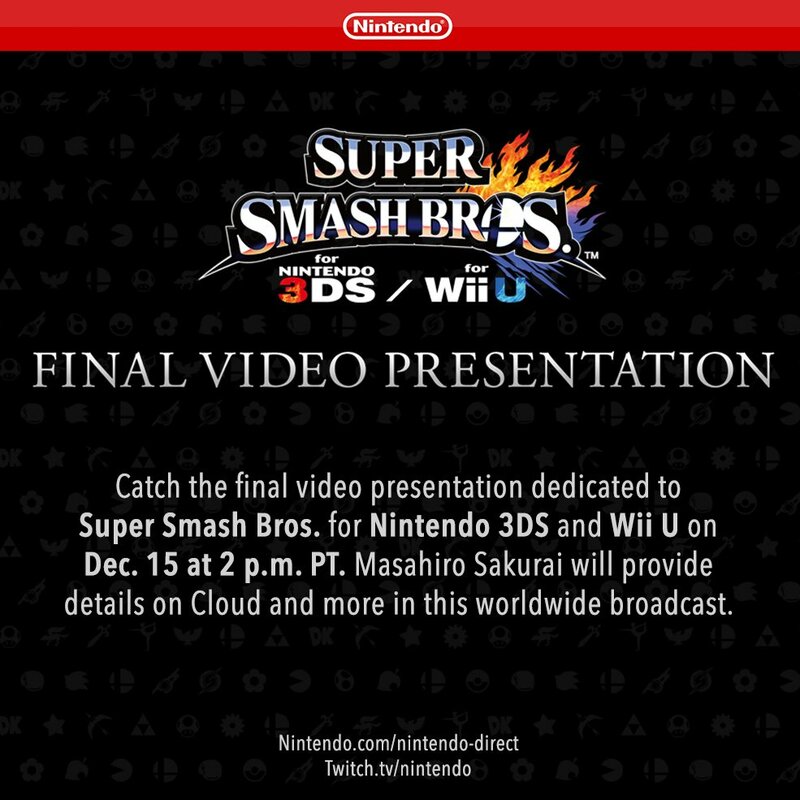 Yes, the final video presentation for Super Smash Bros. for Wii U and Nintendo 3DS will be next Tuesday, December 15th, as promised in the last Nintendo Direct. As usually, Masahiro Sakurai, being the legend that he is, will be presenting the juicy information directly to us, detailing on the highly-anticipated Cloud Strife in addition to ‘more’, and the ‘more’ is where the real hype will be. Without question, we should be getting an update on the Smash Ballot. I don’t think it will be like ‘oh, King K. Rool is one of the winners of the ballot’, but knowing Sakurai, that’s not surprising nor exciting. Instead, the closest thing to this will be a ‘highlight reel’ of all the popular characters in their own games, giving us an idea of who Sakurai was thinking of. Then, reveals galore. I’m thinking somewhere between 2-5 character reveals, especially if this is to be the last one dedicated to the game. Personally, I think 6 more characters, including Cloud, is the maximum to be added, but whether they will all be released in one package or not, we do not know. And that is what makes it exciting. Inklings are very likely in my opinion, but we could be thrown a curveball and hit with Waluigi. We really don’t know, but as long as it isn’t Steve from Minecraft, I’ll be happy. Characters can’t be the only thing to be announced. Along with characters, new stages will be accompanying them, one of which is Midgar, which looks bleedin’ awesome. I’m personally hoping for Spear Pillar from Brawl and Big Blue from Melee in terms of returning stages, but it isn’t as likely as brand new ones. Mii Fighter costumes are also a given, seeing as there was the tease with those Chocobo outfits. Since Square Enix are partnering with Mr. Sakurai, I would love to see an outfit based on Sora (I would have actually prefered him to Cloud actually! ), as well as a great Brawler outfit, as we seem to have a shortage on those. Furthermore, I think it’s highly likely we can see a new mode or something like that. It would help to give the game a more fresh appeal to those who have already tanked through its single-player content. I will post a separate article that will remind you that there is the presentation going on, that will come with a variety of sites. In addition to that, expect to see our coverage of what went down, as well as some of our staff’s reactions! Get your bodies ready, this is going to be big.